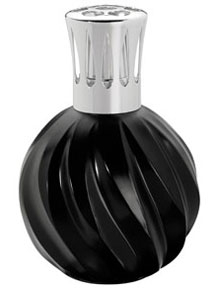 This popular Swirl black lamp with a gold top from Lampe Berger has a nice masculine side. The swirl pattern is a tried and true award winning Lampe Berger design. It comes in the Lampe Berger gift box with burner, funnel and instructions.